Sadly, after six years, Maggie Edmonds’ much-loved local produce stall will shut its doors for the final time on Sunday because its lease is not being renewed. Ms Edmonds started the farm stall after taking out the WA Rural Woman of the Year award in 2008. She won a $10,000 bursary which had to be used for the benefit of the rural community. 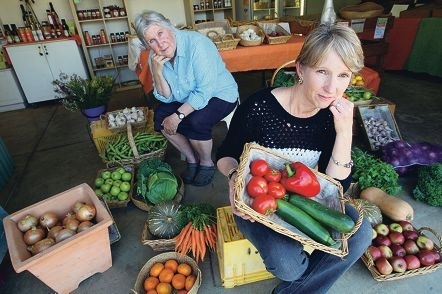 Since then, the Gnangara Road farm stall has built a reputation of fresh food and friendly service from its eternally smiling operators Maggie Edmonds and Leanne Lawson. ‘As a farmer, I thought the best thing I could do was to go farm direct and bring in seasonal fruit and vegetables into the Swan Valley,’ Ms Edmonds said. Pictures and art that hang on the walls speak volumes about the farm stall’s relationship with the community. ‘We love our customers and I think we have become a part of each others lives” we’ve got close to them as friends,’ Ms Edmonds said. It is little wonder why ” Ms Edmonds spends three days a week driving around to farms ” from the Perth Hills to Gingin. After the farm stall closure, Ms Edmonds will look to sell her Bindoon property and relocate to the South West. Ms Lawson will balance her other jobs ” at a supermarket and home duties as housecleaner and mother. Property owner Isla Edgecombe said once the lease was finished her adult children would seek to carry out what her late husband Walter Edgecombe dreamt for the property. Edgecombe Chalets opened at the rear of the Gnangara Road property in January and the family will use the Maggie’s Place shed to sell fruit and vegetables grown on the premises.